The weather outside may be frightful to you, but it could be a welcome sight to burglars who take advantage of winter conditions to break into homes. While you’re busy keeping your pipes from freezing and scraping ice from your car’s windshield, burglars are busy planning their entry into your home. It can be hard to monitor your property’s security when you’re worried about all the other maintenance winter weather brings. Here is how winter weather affects your safety and security systems. Should snow build up on your camera lenses, then any footage they captured won’t be much good. Position your cameras under a ledge or inside a box that protects them from snowfall. Check your cameras regularly, and if you see that snow has fallen on the lenses, wipe it away. If temperatures drop too low, your camera lenses can freeze and crack. It could be a good idea to keep cameras capturing outside activity, inside the house, and simply have them facing a window. Or, consider putting them inside an insulated but transparent box. Should condensation freeze on your motion-activated camera’s arm, it could become stuck, and fail to respond to movement. Check your motion-activated cameras for ice or condensation—on the body and lens—regularly to prevent this issue. Severe temperature can actually affect battery life. If you have battery-operated systems, check their levels regularly as they may drop quicker during the winter. Snowy weather and misty days make it harder to see far out into your yard. You cannot rely on your own vision to spot people approaching your home. That’s why it’s more important than ever to keep your motion sensor alarms around the perimeter of your property on. During the summer, if a neighbor sees someone wearing a ski mask approaching your vehicle, they know to call the police. But seeing someone in a ski mask isn’t out of the ordinary during the winter, making it easier for burglars to break into cars unnoticed. Keep your car in a locked garage during the winter. If you have a backup power supply for your security system, it likely runs on batteries. During the winter, you may experience many power outages—too many for your backup supply to recover from in time for the next one. Check the battery supply on your backup generator regularly. If snowy weather affects cell phone towers, then you may not be able to call the police successfully during an emergency. Make sure you have a neighbor whose home you can escape to during an emergency. Do not attempt to stop a burglar on your own. After snowstorms and other severe weather, roads to your home can be blocked, making it difficult for police to arrive quickly in an emergency. That only makes it even more essential to have all of your security systems—from your perimeter motion sensor alarms to your scheduled locks—in working order. 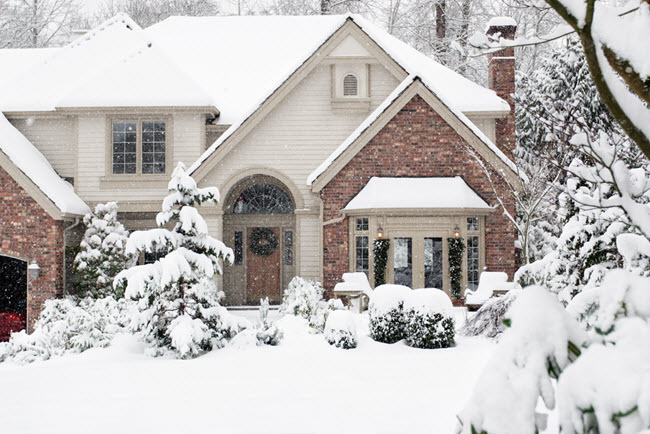 A snowy day is only cozy so long as your home is safe. However, winter weather provides some unique opportunities for burglars to make their move. Keep these hazards and tips in mind so that you can enjoy the chilly season, without concern for your safety.